The Ladies’ Repository (July, 1858), plate preceding p. 385. 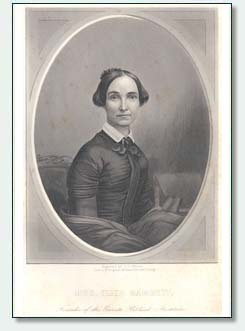 Eliza Clark Garrett was born in Newburgh, New York. She married Augustus Garrett in 1825. The couple’s two children, a son and a daughter, both died at a young age. After living in Cincinnati, Ohio, and New Orleans and Natchitoches, Louisiana, the couple settled in Chicago in 1834. Mr. and Mrs. Garrett were baptized at the Clark Street Methodist Episcopal Church in 1839. Mr. Garrett served as mayor of Chicago from 1843 to 1844 and again from 1845 to 1846. 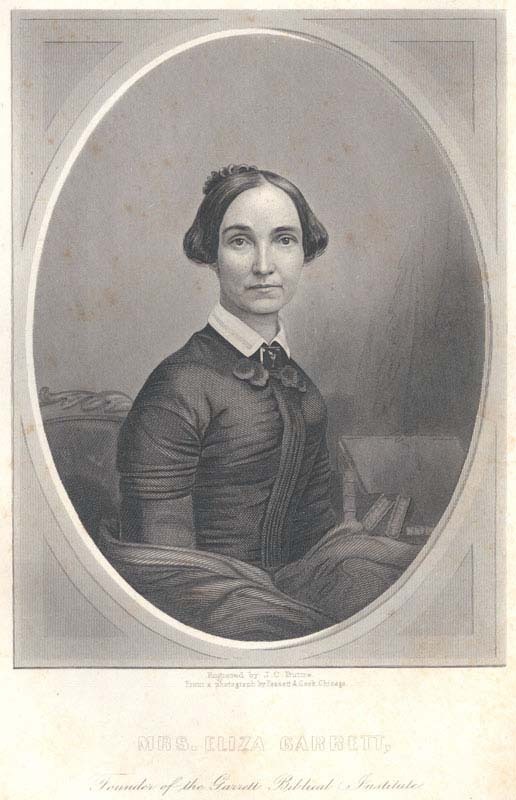 When her husband died in 1848, Mrs. Garrett received half of his estate, a portion of which she used to help found the Garrett Biblical Institute in Evanston, Illinois, for the training of Methodist ministers. Opened in 1855, shortly after Eliza Garrett’s death, the institution exists today as the Garrett-Evangelical Theological Seminary.